Kudos to Tribe Hummus for advancing the enjoyment of this healthful spread and snack. In addition to a hefty standard line-up, the company continues to produce limited edition flavors to please the palate. The current limited edition, Limited Batch Herb Infused Olive Oil, is a delight, spiced with sesame seeds and za’atar† (also spelled zahtar), a spice blend that is very popular in Middle Eastern cuisines, including Israeli. Harvest Carrot & Ginger, one of Tribe’s new Farmer’s Market flavors. Photo courtesy Tribe. *Flavors from the Tribe Originals Line: Classic Hummus, Cracked Chili Peppers, Everything Hummus, Extra Smooth Classic, Forty Spices, Lemon Rosemary Focaccia, Mediterranean Olive, Mediterranean Style, Roasted Garlic, Spicy Chipotle, Spicy Red Pepper, Sweet Roasted Red Peppers, Zesty Spice & Garlic. Classic, Roasted Garlic and Sweet Roasted Red Peppers are also available in organic versions. †Za’atar is actually the Arabic word for Lebanese oregano, a member of the mint family Lamiaceaea, that was known in antiquity as hyssop. The za’atar blend will vary by the blender, but includes dried thyme, oregano, marjoram, toasted sesame seeds and salt. Some blends add coriander, cumin, fennel seed or savory. A Palestinian variation includes caraway seeds. To these spices, the unique components of Lebanese oregano and sumac berries are added. The sumac, ground into a reddish-purple powder that is a popular spice in Middle Eastern cuisine, imparts a tart, fruity flavor that differentiates za’atar from other spice blends. 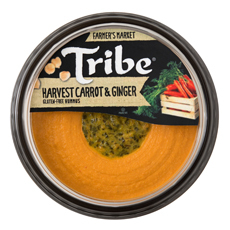 Tribe’s Harvest Carrot & Ginger Hummus. Photo by Hannah Kaminsky | THE NIBBLE. 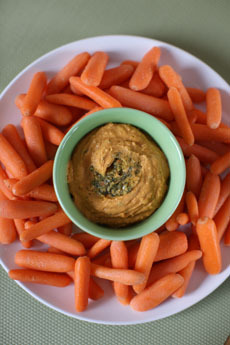 The Harvest Carrot & Ginger Hummus, in particular, has a festive orange hue that looks especially nice for holiday snacking. Served with a platter of crudités, it’s a better-for-you option among the rich holiday fare. The orange color also fits right in with Halloween and the entire harvest season. Prep time is 5 minutes, cook time is 5 minutes. 1. PLACE all ingredients in a food processor and pulse several times to coarsely chop. Then let food processor run for about 2 minutes until smooth. 2. REMOVE hummus from food processor bowl to serving bowl, using a spatula. Serve with dippers of choice. Contrary to popular belief, baby carrots are not grown bite-sized. They are bred long and slender, and then cut into two-inch pieces and lathed to a uniform width. According to Web MD, carrots do, in fact, help with vision. They are high in vitamin A, a nutrient essential for good vision. Eating carrots provides the small amount of vitamin A needed for good vision. (Vitamin A is also be found in cheese, egg yolks, liver and milk.